Apple finally approves the Fring updates that make it possible for the use to enjoy two way video calling. The consumer not only easily use front-facing camera but also make video calls over 3G. Good news not ends here; with the mean of New Fring version the user can contact face to face with other. Two ways video calling is possible when other side individual has mobile features with front camera. This video calling is possible with mobile other than iOS 4. 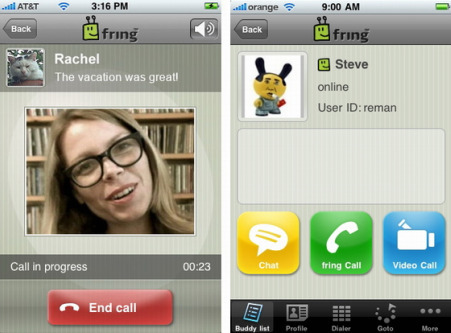 Fring provides various options to the mobile users like free voice calls, free video calls and live IM chats directly from your iPhone and iPod touch. So if you want to avail the opportunity of video calling just go to Apple itunes app store now and downloaded this update version of Fring for your iPhone, iPod and iPod Touch.